Vetty Officer's Weblog: ...and this is damn serious!!!! Well, being a common-man, I cannot turn the whole world upside down to save these things. But still today I can record as many good things I can in the internet, for the future generations to search, read, admire and why not even celebrate. Here is one such attempt to preserve a truth in the history and that truth is - I am a Cricket Player!!! Still you don't believe me. Just see the below picture to see a sample of how well I bowled on that day. 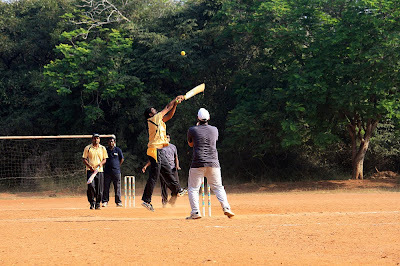 The batsman, even after trying to play like tennis, couldn't touch the ball with his bat. Don't miss the terror expressions in the runner's and umpire's faces. You believe it or not - the truth is always truth - I am a cricket player... cricket player... cricket player!!! Well, if you want to know why I didn't bat and just stopped with bowling. Here is the history for that. amam da.. Idhu enakku thonama pochae!! !